“Jamia Millia Islamia stands for Peace, Communal Harmony and Tolerance”; posters with messages such as these welcome us inside the Jamia campus bordering South Delhi. Moving along the University, the road narrows down ahead at the chowk. An elevated cemetery to our left marks the entrance to the famous Batla House. An uneasy calm prevails through the lanes of the market inside Batla House and Zakir Nagar; days after an encounter took place at the neighboring Jamia Nagar killing an inspector and two terrorists. Life in and around the locality has come a long way since then. Fear psychosis runs deep here. While some shopkeepers lament a decline in footfall, there are some who find no difference in the number of people thronging the markets before and after the blasts. Tahir Aalam, a shopkeeper, says “There is a constant fear in our mind. Bomb Blasts have become so common; and after the encounter it’s not easy to carry on. Compared to last year the sales have come down to 60%." The days of Ramzan seem to have brought back the lost festive spirit. As we hop inside the busy lane towards the centre of the main market on a rickety rickshaw; our eyes come across the crowd and the activity along the market-side. There is hardly space to move. Chicken Kurta and Salwar shops; along side the eateries are full abuzz. Outside shops, banners, wish “Ramzan Mubarak” to one and all. Ladies clad in black burqa can be seen enjoying the shopping season with their children. The pushcart peddlers, hawkers and sweetmeat stalls are a common sight due to the festive season. Shafiq, owner of a Duppatta store, feels, “It was difficult for a few days. But, Things seem back to normal. Markets have regained strength. It’s festive all over”. 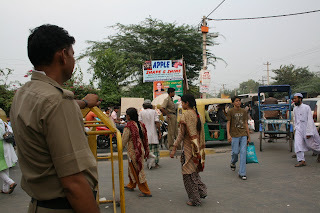 The policemen can still be seen standing guard on the various corners with barricades on the middle of the road. 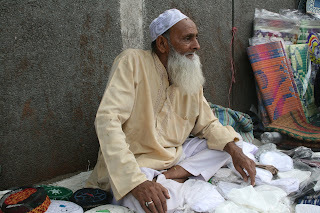 On the pavement, just besides the door-mat shop on the road, my eyes freeze on an old man, perhaps talking to him-self; selling white skullcaps. Luckily, he is happy to converse and speak his mind out. As I ask him, “Chacha, kaisa mahol hai?” (Uncle, how is the atmosphere out here? ); a distinct sparkle reflects through his smile. He replies, “Aman hai. (There is Peace)”. As the journey ends, its evening, and slowly getting dark. The call of aazaan breaks the eerie calm. It is time to break fast, commonly known as Iftaar. Batla House is left behind at a distance. Walking down the road, an unknown security officer at one of the gates of the campus offers a few dates to eat. Happily accepting the treat we move on. 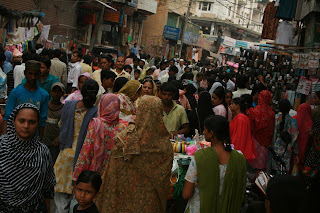 There surely is much more to Jamia Nagar; apart from the narrow lanes, the white skull caps and the black burqa. Thoughts of Mohammad Rahat Khan remain simple, basic yet so intense. True! We have to look at the postives . Unfortunately media only highlights those sentiments, incidents which further divide people. Your sensitive observations and graphic description of the dualities and complexities of life, arguing that life is not just black and white but is layered and human emotions are informed by multiple emotions have to be kep in mind , especially the postive ones. Takes guts to go there, observe so well and ask such questions... Good job and of course gutsy job! hey good to read something positive abt the life after the encounter had just been reading or seeing that life there is now pathtiec. good work adi..n ur photography is worth complimenting.. just apt pics for the kind of blog..